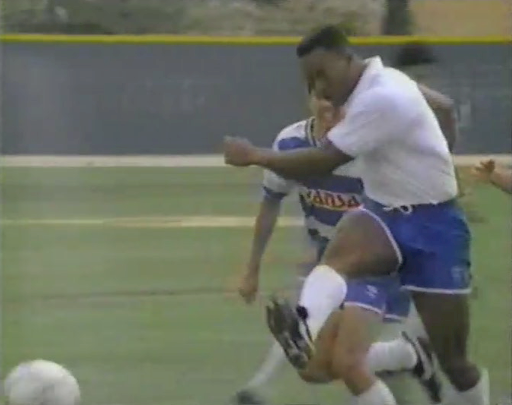 America didn’t know that Bo knew soccer in 1989. So there’s a rare, little-known version of the Bo Knows commercial that not even the magic of YouTube has conjured from the vaults. No, not that extended “biker chicks” version. I’m talking about the one that aired only in Europe, but still where the teenagers apparently learned English just to watch Nike’s latest shoe commercials in Michael Jordan’s native tongue (except in France, where broadcasting American commercials not dubbed in French was illegal). That 2014 World Cup beneficiary Nike deemed American audiences not ready for an extra, oh, six seconds of soccer footage capped with a Old Country jab at Yankee patois shows just how far the sport that Auburn introduced to the south has come in the colonies (or at least in our media) over the past quarter century. The cricket scene, which seems to also have been intended only for European audiences, was eventually added the American version; Bo playing cricket, anyone playing cricket was hilarious. And a soccer ball juggling Bo can be seen for a slit second before fading to the back of the pack in Nike’s meta, even more pan-sportsual Bo Knows commercial released in 1990. In 1989, however, promoting “real football”—I don’t think I even knew soccer was called anything but soccer in 1989—seems to have been too culturally risky. In 2014, the Blessed Individual is doing World Cup commercials. Video h/t: An obsessive Auburn fan. Related: ‘Bo had better commercials’: An interview with ‘Bigger Than The Game’ author Michael Weinreb.